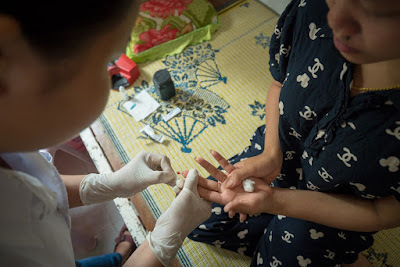 with a preganant woman at a health centre in Kratie province. 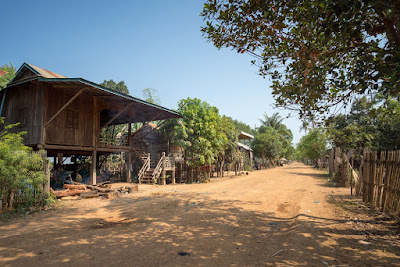 Kratie province, Cambodia, July 2018 – Khut Sokhorn is a 39-year-old rice farmer from Kampong Damrey village in Boeung Char commune, Kratie province. Though it lies along the Mekong River, her village is remotely located and difficult to reach. The closest towns are found many kilometers away, where they are accessible only by boat. This means that essential services are isolated not only from Sokhorn, but also from the 93 other families who live in this village. Kratie province, Cambodia, July 2018: A bevy of children, most between the ages of 3 and 5, are running around a playground in Trapeang Traing village, taking turns swinging on a tire swing. The community’s only playground is located on the grounds of the local community preschool.